Juicy Apples by Mad Hatter Juice is a treat for apple fanatics everywhere. Brimming with tangy, juicy apple sweetness, Juicy Apples vape juice delivers natural, balanced flavor without ever being overly sweet. Fruit liquid lovers, say hello to your new all-day vape. 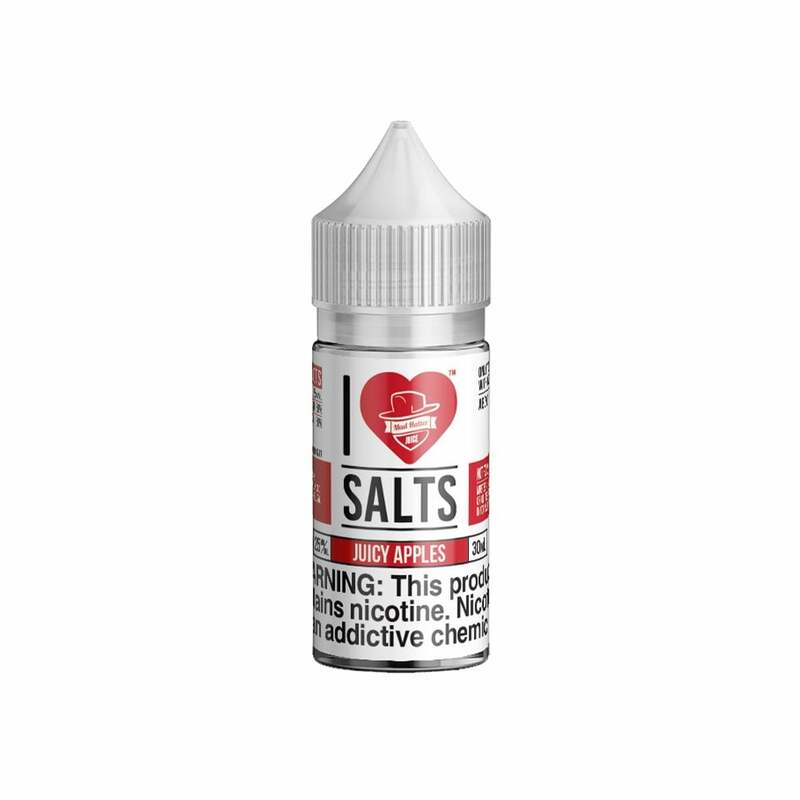 Best apple flavor nic salt that I tried. Feels exactly like an apple flavor shisha. Very smooth taste and good hit on 50 mg.
Good juice. Really a great apple flavor. Burns quick. Light and refreshing. Intense apple flavor. This could be a all day vape but the apple is really intense. Overall a quality product. Would buy again. Amazing juice. My everyday juice for my breeze 2. If your on the fence, just get the juice, you'll thank me later. The flavor definitely resembles Apple. But there is a harshness with this liquid compared to other liquids of the same brand. Ok....This juice LITERALLY tastes like you bit into a sweet green apple. (Without the twang that they have) Smells like apple juice. Have been using this all day since I bought it a couple weeks ago! Great brand,Apple flavor is Right on It! For a 25mg salt ,the flavor is all there,Juicy ripe apple. Right now this is my favorite sweet non-tobacco flavor. It's called 'Juicy Apple' and somehow they've managed to actually create a flavor that tastes juicy as well as being apple-flavored. It's great to find a flavor that tastes like the name on the label. FANTASTIC juice! Just bought the bottle less than two weeks ago and it’s already almost gone. My smok novo gets a really good Apple flavor that is great and light for all day vaping. My boyfriends sourin air, pulls the flavor so well you can practically taste the apple skin like your biting an apple. it sits at the front of your tasting pallet and just makes your tongue water. Nice juicy red apple right in your mouth. My boyfriend is obsessed. my girlfriend and I use a Juul for whenever we need a smoke. and my girlfriend who loves apples was honestly skeptical about ordering this juice. however after we ordered it and tried it for the first time it truly tasted like JUICY APPLES and we both loved it. for me personally out of all the mad hatter juices that I have tried so far LUAU LEMONADE and JUICY APPLES are the best and will be ordering again. Tastes just like a green apple....good fall flavor. THIS FLAVOR IS AMAZING. It’s like a cross between apple juice and those Chewy Sprees candies. Hits great on my Suorin Air, like other mad hatter “I love salts” juices. Love love love this flavor and makes coil last longer. Much more so than other sweet or fruity flavors. This juice tastes very similar to Apple Ale. A perfect Vape for fall. In the right device this flavor is very good. Nice apple smell and taste. Make sure device is Nic Salt compatible. I was surprised by this one. Didn't think I would like it as much as I did. The first time I tried it, I wasn't really sure about it but the more I used it the better I liked it. Good one. This has been the best nic salt juice that I have tried so far (and I have tried several since I stopped smoking cigs). I love the smooth taste of the apples and there is no after taste when I vape this juice. I can literally use this nic salt juice in all my pod mod devices- including the new refillable pods made by Blankz, for the JUUL. I use this in my Suorin Air and in my Kandypens Rubi pods. Awesome juice!